This deceptively simple skirt has been designed with beauty, simplicity and practicality in mind. It features double stitched, hand rolled seams stitched in grey or black thread, plus a full skirt and two patch pockets. The best part about it though, is it's lacing closure. Completely adjustable with the lacing cord made from the same fabric as the skirt so it won't work itself loose. 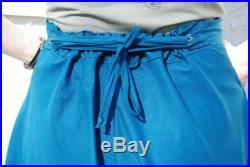 It is feed through a back portion of the 2 wide waistband, out again and then laced through buttonholes (3 per side). When putting it on, i recommend having the lacing at the front of you, tying it up and then twisting it around. I have found that this skirt is ideal for pretty much any activity you would normally wear a skirt for. The fullness makes it light and breezy in the summer, but the raw silk is a dense enough to make it practical for the spring and fall when paired with light weight tights or leggings. I particularly like wearing this skirt when i travel, the silk doesn't wrinkle easily when i'm seated for a long time and the pockets are super handy. Since this is an adjustable skirt, the sizing is a little fluid. The first number is how small that size is when fully cinched up, the second number is how big that size is when fully loosened. You will want your waist (natural waistline or slightly below) to not be smaller then the first number and your hip/widest part measurement to not be larger then the second number. Small: 25"-37" (63.5-94 cm). Medium: 30"-43" (76-109 cm). Large: 36"-50" (91.5-127 cm). Length in front: 24 (61 cm). Length in back: 27 (68.5 cm). If you are unsure, convo me with your measurements and we'll chat. 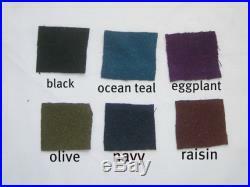 Current available colors are: black, eggplant, ocean teal, olive, navy, raisin. Care: hand wash or machine wash in cold water on a delicate cycle. Hang to dry or machine dry on medium heat. As always, the gentler you are when washing your clothes, the longer they will look their very best.